Chocolate is a symbol of love. No wonder many people give chocolate to their loved ones. Well, besides the sign of affection, chocolate turned out to have health benefits. The following 5 benefits are obtained by eating chocolate. 1. A healthy heart You should know that chocolate nutrition comes from cocoa beans. Why is that? Because cocoa beans are rich in plant nutrients called flavonoids. Among the various types of chocolate, the type of dark chocolate is the largest containing these nutrients. What are the benefits of flavonoids? These substances have antioxidant properties that can reduce the risk of heart disease. In addition, according to health experts from Harvard University, eating moderate amounts of chocolate also reduces the risk of atrial fibrillation - an irregular heartbeat condition that can increase the risk of stroke, heart failure, and other heart complications. 2. Repairing muscles faster After exercising, don't forget to drink or eat chocolate, because it is said to restore the body more quickly, especially in the muscles. Less trust? A study from the University of Texas at Austin found that athletes who drank low-fat chocolate after exercise - not carbohydrate-based sports drinks or calorie-free drinks - experienced faster recovery. 3. Improve brain ability If you start forgetting often, try consuming chocolate. A study in 2014 found adults who consumed high-flavonoid cocoa supplements for three months performed better on memory tests than participants who took low-flavonoid cocoa supplements. In addition, a 2012 study published in the New England Journal of Medicine revealed that regions with the highest consumption of chocolate had more residents who received the Nobel Prize. Well, if the Nobel Prize winner only consumes more chocolate, maybe we also have to. 4. Cleanse the skin Maybe parents once forbade us to eat chocolate because it will damage the skin. Apparently, eating chocolate actually improves the skin. Some studies reveal chocolate can help protect against harmful UV rays. But you should choose chocolate that is low in sugar, because most sugar can actually increase the risk of acne. 5. Reducing excessive appetite If you feel eating too much, dark chocolate can be a solution to reduce the appetite to chew even more. 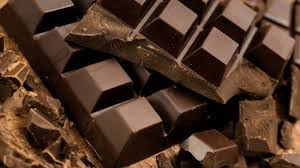 Eating dark chocolate can help regulate appetite, according to a small study by University of Copenhagen researchers. This applies if you like sweet, salty or fatty foods.